Prepare fixative: 4% paraformaldehyde, 25mM NaCl, 1mM CaCl2, in 0.15M cacodylate buffer, pH 7.2. Wash animals into wells of Pyrex dish in fixative. Microwave 2X (5 min ON, 2 min OFF) then hold 90 min on ice (restriction temp = 39°C; 56 watts, for all microwave steps). Temperature may range from 13°C to 24°C during irradiation. 4X rinse in 25mM NaCl, 1mM CaCl2, 0.15M cacodylate buffer, pH 7.2. Microwave 1 min with each rinse. Embed samples in 3% Type VII agarose, then hold overnight at 4°C. Chop out samples in small agar cubes and transfer to snap cap vials in buffer. 2X rinse in 0.2M Na Acetate buffer, pH 5.2, 10 min each, on ice. 1.0% Uranium acetate in 0.2M Na Acetate buffer, pH 5.2, 60 min on ice. Dehydration schedule done on ice, 30% methanol, 50% methanol, 70% methanol, 10-20 min each. Dehydration/infiltration schedule done at -20°C: 90% methanol, 3hrs, 45% methanol, 45% LR Gold, 10% PVP, 2 hrs, 27% methanol, 63% LR Gold, 10% PVP, 4 hrs, 100% LR Gold, 3 hrs, then 4 X 100% LR Gold + 0.5% BME, 3-5 hrs each change at -20°C. Arrange samples in gelatin capsules and cure at -20°C for 24 hrs under UV irradiation using Pelco Cryochamber (see EMMicroIFIG 2). 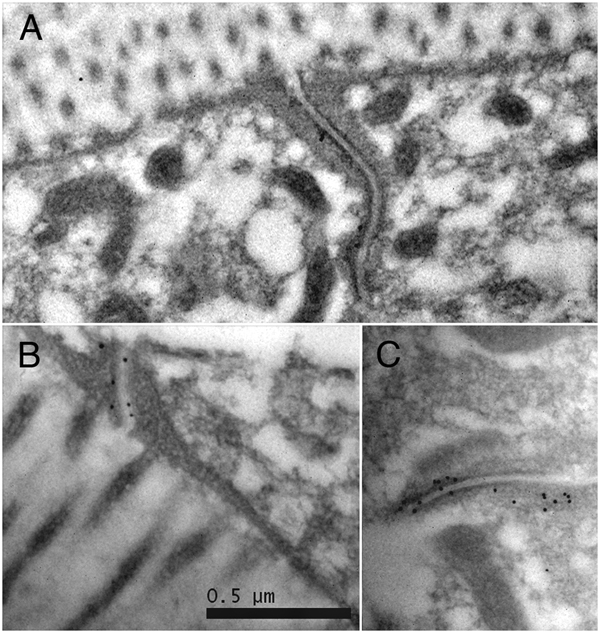 The procedures used to conduct microwave fixation and embedment for postembedding immunocytochemistry are similar to those used for the ultrastructure (see Microwave Assisted Fixation for Ultrastructure). The principal changes are a reduction in the amount of fixative to protect the epitope from degradation, and a change to an alternate plastic resin for embedment to allow epitopes to be well exposed at the surface of thin sections during antibody treatments (epoxy resins are too hydrophobic to permit good access to the antibodies). EMMicroIFIG 1 shows examples of immunoEM after microwave fixation. To minimize possible damage to the desired epitope(s), this protocol avoids use of an osmium stain. However, depending on the epitope, it is sometimes possible to add a very mild osmium step to increase contrast a bit. The en bloc stain with UAc is not expected to interfere with antigenicity, and should add some contrast to the tissue. All steps in this protocol are shifted to lower temperatures to protect the epitope, including filling the Coldspot device with cold water in step #1. In this example, animals are manipulated into an agarose block in order to group multiple specimens into close proximity. (See the suggestions in Standard Immersion Fixation for Structure), using a heated wire to manipulate worms into alignment in the agar, and to build an agar block where animals lie well away from either side of the final cube). The agar block technique is helpful when applying antibodies to thin sections (see below), since there will be more animals in a small cluster, and therefore more tissue exposed to the antibody in each thin section. Several alternative embedding resins can be used for this method, including LR Gold, LR White, and Lowicryl HM20. During the UV cure, temperatures inside the Pelco Cryochamber may vary widely, as this simple unit chills the samples over dry ice pellets with a small fan to equilibrate internal temperatures inside the box (EMMicroIFIG 2). Samples will generally cure within 1 day under UV, temperature stays within a range of –30 to +10°C. At –35°C or lower, the LR Gold resin may freeze without curing; this must be avoided at all costs. If blocks are only partially cured after an overnight exposure to UV, add more dry ice (if needed) and continue UV exposure for another 24 h to achieve a hard block. Another possible solution if the block seems too soft or rubbery at the end of a UV cure is to place the block into a 60°C oven overnight to harden. One should pretest the susceptibility of the epitope(s) to damage by the primary fixative when choosing the fixative for step #1 (Hall, 1995; Paupard et al., 2001). This pretest can be conducted using immunofluorescence, which is much faster and cheaper than an EM immunocytochemistry run. It is often possible to include some glutaraldehyde in the primary fixative to improve tissue preservation (See Summary Protocol above). EMMicroIFIG 1: ImmunoEM after microwave fixation. 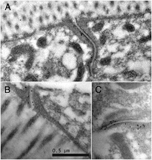 A, B, C. MH27Ab labeling adherens junctions in adult intestine. Gold-linked secondary Ab (black dots) indicate where MH27 Ab has bound to the thin section. From work of April Reedy, Pam Hoppe, and Ken Nguyen. EMMicroI 2: Pelco cryochamber. A. Top view of the inside of a Pelco Cryochamber (available from Ted Pella Inc.) for UV cure of plastic resins for immunoEM. Samples are kept chilled to cold temperatures by the provision of dry ice in the bottom of the box, wrapped in insulating material. A metal reflector lies above the dry ice, creating a zone where UV light, supplied from a lamp on top, can bounce back and forth through the specimens, which are suspended above the reflector, and below the lamp. Resin samples are typically in transparent gelatin capsules, attached by ties to two metal rods, or set into an open mesh holder atop the metal rods. B. Side view of the Pelco Cryochamber when closed. A switch on the top lamp housing controls the UV lamp and another electric cord is for the operation of the fan, which keeps cold air flowing inside the chamber while it is closed. A temperature gauge is set into the top, to give a continuous reading of the inside chamber temperature.